“We need a lot more live music in this town.” James Desautels declares. So, he has devoted himself to the prospect of training more singer/songwriters here at MRU to fill that void. As an award-winning violinist, Desautels has jammed with the best. Boasting collaborative events with the likes of Luciano Pavarotti, Willie Nelson, Elvis Costello and Pearl Jam, his versatility rivals his passion. It’s that passion that led him to become MRU Conservatory’s ‘first string’ recruiter for pop music enthusiasts. “We all like the term popular music because it’s timeless.” Desautels explains. 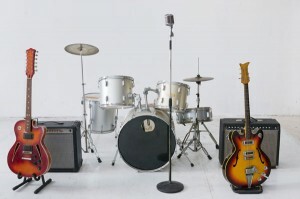 “Something that was a hit in the ‘30s and is still around now is still ‘popular’.” He has high hopes for students in this program, especially the Introduction to Song writing Class. But the question is, how can one teach creativity? A relatively new course of study for MRU Conservatory, Desautels’ popular music instruction has been, for lack of a better term… popular. “The intro course is broad, all levels,” he says. “And the artists that took it want to take it again.” Which is, in part, the reason that the Advanced Song Writing course is being offered in the Winter 2016 course calendar along with courses in Music Business, Intro to Song Writing and a brand new course, Popular Music Band. Fill the live music void in town. Get a band together and sign up. “You’re going to get traditional, favourite carols and some hidden gems.” He explains. 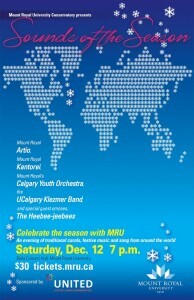 With selections including the University of Calgary’s Kletzmer Band’s arrangement of “Happy Hannukah” back-to-back with Handel’s Hallelujah Chorus, it certainly is a holiday show for everyone. Kantorei will be sharing the bill with their younger counterparts Mount Royal Artio (directed by Jean-Louis Bleau) and the Calgary Youth Orchestra (directed by Edmond Agopian). They’ll also be joined by their guest emcees, Calgary’s comic a cappella favourites, The Heebee-jeebees who can always be counted on to provide a festive comic punch.